Propaganda is a Latin word. Originally it was used by horticulturists to describe a method of propagating plants. The Catholic church adopted it to describe the method by which to propagate the Catholic faith. The method could create an attitude toward any individual, organization, or ideal by influencing opinion... It can be religious, cultural, or political, and it is used in all the means of communication, as well as the arts. It plays a large role in internal, as well as external relations, The Voice of America, and The U. S. Information, for instance. Propaganda can be a very effective both as a tool or a weapon, in the hands of experts but a loose cannon in the hands of non professionals. All you have to do is tune in any call in show to see what I mean. It's all Negative or Positive propaganda. Positive propaganda praises a sponsor's product or service and negative propaganda condemns, demonizes, insults, slanders, and all but cuddles an opposing political party, religion and anyone associated with the ideal, belief, or proposition. Positive propaganda is handled by a professional propagandist, while Negative propaganda is left up to the caller, that is because the radio station must not get too deeply involved in the negatism or it may be held liable. The talk Master can control the conversation by allowing station sanctioned negativism and cutting short opposing callers. Incidentally, never assume that call in radio is about the caller's freedom of speech, it all about the station's freedom of speech. Talk-shows do not represent one view-point or another because of their profound belief and commitment to "the cause." Most of the stations are part of a greater corporation that depends on a Special Interest of some sort for most of it's funding. ; Their corporate offices are lobbied by deep pocket bag-men just as aggressively as they lobby politicians, and should you be under the spell of talk-shows and think that these lobbyists are committed to the ideal of better their services broadcasting, better government or better unity of any sort, guess again. They are mercenaries, their loyalty is for hire to the highest bidder. Talk radio has the means by which to reach thousands of listeners, and for a price they will deliver the client's message. 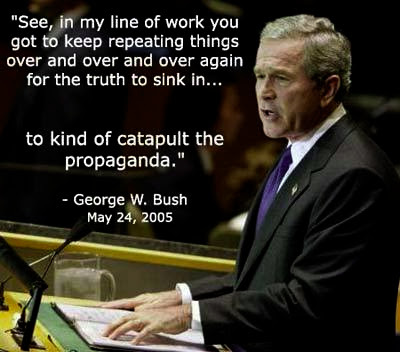 If it is an honest message it is Positive Propaganda, if it is not, it is Negative Propaganda. Sales Propaganda has to be phones, or the FTC would come down hard on the station. In other cases the intent of the perbetrator is taken into account. Not in sales propaganda, ignorance is no defense when it comes to defrauding in sales propaganda, the intent to defraud does not have to be there to obtain a conviction. In other cases, the perpetrator's familiarity with the product is taken into account, but not in sales propaganda. None of this is true about Political Propaganda. Physical contact is about the only thing that is forbidden in political propaganda. That is why candidates, radio talk-show hosts, and callers can get away with what they say. Not because Talk Masters, Networks, or individual radio stations protect the callers freedom of speech . The Constitution does that. What talk-radio does for your freedom of speech is to make you jump through a dozen hoops before you are allowed to practice it on certain shows and if you get passed the screamers and on the air, the host can still hang up on or give you the bums rush so that you cannot fully express yourself then spend the next half hour criticizing what they think you were going to say. I won't paint all talk-masters with the same wide brush. There are some that air both sides of an argument, but most let it happen only if the criticism is what they would say themselves. Once again I ran out of space before I got to my main point.